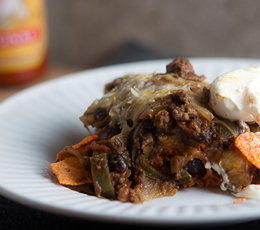 Taco Bell’s latest hit in a homemade casserole form. Just as tasty and almost as fast…ready in half an hour. Thank you Lauren at healthy-delicious.com for this creation! Heat oil in a large skillet. Add the onion, garlic and jalapenos. Saute 5 minutes, or until soft. Add meat and taco seasoning. Cook, breaking up meat with a wooden spoon, for about 5 minutes. Add beans and salsa. Mix well and continue to cook until salsa thickens. Line the bottom of a casserole pan with tortilla chips, pressing down on them lightly to break them into bite-sized pieces. Spread the meat and bean mixture over the chips and top with cheese. Bake for 20 minutes or until cheese is melted and gooey. Cut into 8 servings. Top as desired. Scoop up with additional chips.